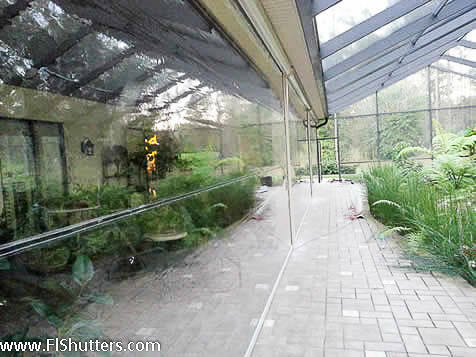 Different types of mesh fabric options are available for Retractable screen . The operation of the screens is manually or motorized. 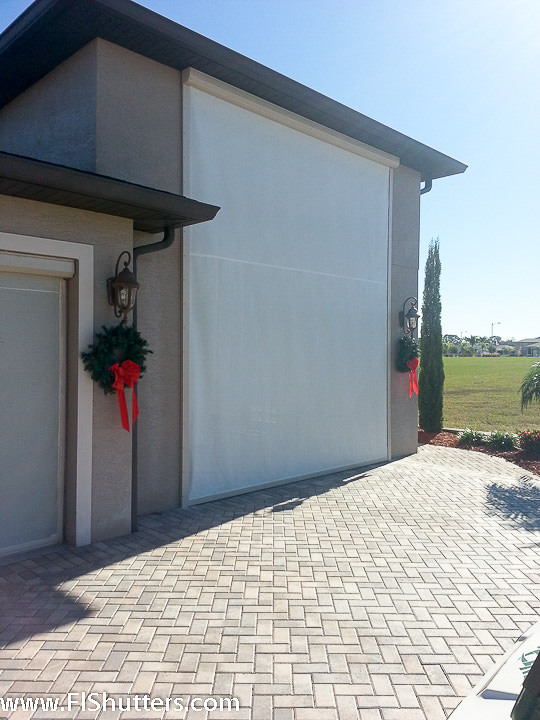 Motorized retractable screen are ideal for large doors or openings for easier opening and closing. Motorized retractable exterior screen absorb heat, reduce glare and block the sun, provide rain protection, reduce wind speed to create your ideal ambiance. Motorized retractable screen provide a comfortable interior by blocking solar rays, which protects your furnishings, reduces glare and also saves money on cooling costs. Motorized exterior screens can also be used in places such as windows, doors, and especially larger openings in porch to create a pleasant and pest-free outdoor area to enjoy. We use one of the best material available which is designed for use in exterior applications like awnings, shade-sails, blinds, canopies and lightweight tensile structures, Soltis® and Précontraint® 502 exceed performance criteria around the world. Specifiers and building professionals alike have come to rely on Ferrari® textiles for the following reasons: •	Innovative treatments for higher energy performance •	Greenguard® Certification: Indoor Air Quality™ and Children & School™ •	Excellent long-term performance in all climates •	Unsurpassed dimensional stability •	New color range coordinated with other Ferrari® products •	Lightweight and thin textiles for a longer drop from smaller cases •	100 % recyclable Soltis® textiles have a micro-ventilation system that regulates the sun's heating effects. Placed on the outside of windows they absorb and reflect back up to 97% of the heat contained in the sun's rays. LowE: high energy performance Soltis® LowE references assist in increasing interior comfort in buildings by re-emitting less heat. The fabric thereby forms an additional passive cooling source, reducing air-conditioning energy consumption. Soltis® textiles make a strong contribution to reduced energy expenditure, allowing better cost control of the building. Made using the exclusive patented Précontraint® Ferrari® technology, Soltis® and Précontraint® 502 textiles are maintained under tension throughout the whole manufacturing cycle. The result of that is exceptional dimensional stability • perfect tensioning and finish • shape that is retained at installation and over time • long-lasting mechanical resistance • substantially extended lifespan • exceptional flexibility that ensures architectural freedom and ease of fitting • combination of strength in a thin profile and lightweight. We fabricate using high frequency welding. 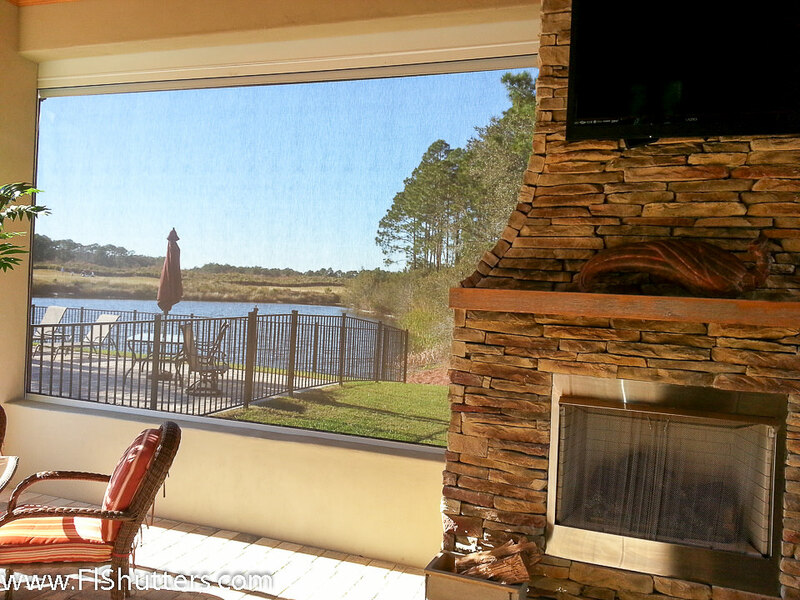 Exterior patio screen absorb and reflect back up to 97% of the heat contained in the sun's rays, looking from patio you can see out while looking from outside provides privacy during the day. Exterior retractable porch screen absorb and reflect back up to 97% of the heat contained in the sun's rays, provide privacy during the day.